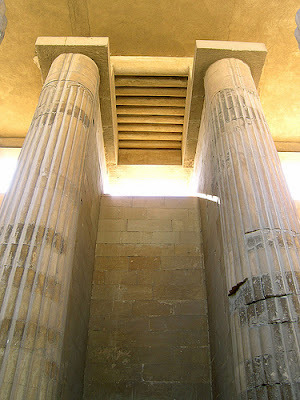 The necropolis at Sakkarah which stretches for eight kilometres is the largest in the whole of Egypt. It is also historically the most important because the principal dynasties are all represented, from the 1st to the Ptolemaic and the Persian. The necropolis is under the special protection of the god Sokar, hence the name of the locality, who is often represented as green with a hawk-headed appearance. In the middle of the necropolis is the funerary complex of Zoser, the pharaoh who founded the Illrd dynasty, and around it can be found other pyramids and mas- tabas characteristic of the various eras. 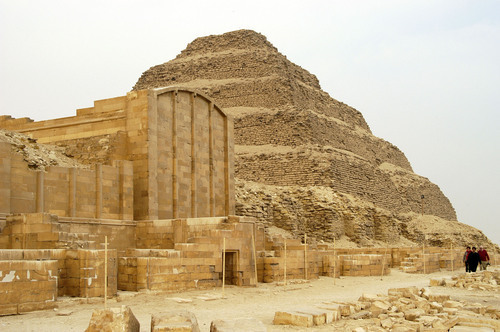 The whole area is dominated by Zoser’s huge step pyramid. To fully appreciate the importance and originality of this pyramid it is necessary to explain what is meant by a «mastaba» which in the Arabic language means a bench. A mastaba was the burial chamber of the nobility and of court dignitaries and it was rectangular with slightly inclined walls. 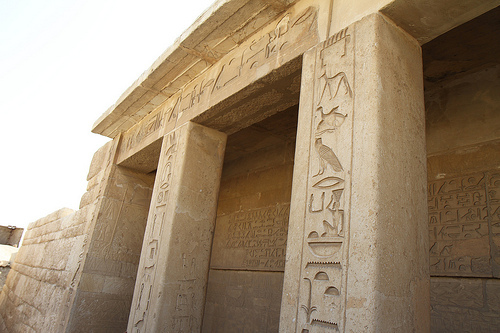 Zoser was the first pharaoh to entrust an architect with the construction of a grandiose funerary complex. This architect, who was called Imhotep and whose name can be found inscribed in hieroglyphic characters on the base of a statue representing Zoser, was thus historically the first architect to receive official recognition and his ingenious structure was the first funerary pyramid to appear in the world. Imhotep was also the High Priest and famous as a doctor. He was such a man of genious that the Greeks, two thousand years later, deified him under the name of Es- culapius. Now what does Imhotep’s invention actually consist of? All he did was to first build a large mastaba and then over it he built a pyramid with four large steps. The pyramid in its final form has six steps on the west part of the mastaba. Centuries later the Sumerians perfected this type of construction in the «ziggurat». Sixty two and a half metres high this pyramid too was originally covered with a facing of smooth stone which today has completely disappeared. By the side of the pyramid are the remains of what is called the «South House», two fluted columns (strongly reminiscent of Doric columns) unevenly framing a doorway surmounted by a beautiful horizontal frieze bearing a motive of sacred knots to protect it for the future (the Khekern frieze). To the south of the step pyramid is the pyramid of Unas, the last pharaoh of the Vth dynasty. Of relatively small size, less than 60 metres square, it was already ruined in 2000 B.C. and it is of interest mainly because it contained a large part of the «Pyramid Text», the first collection of magico-religi- ous texts drawn up during the Old Kingdom and destined to protect the dead pharaoh in the Other World. Written in hieroglyphs and painted in green they start in a corridor and extend over the four walls of the special chamber.